After studying directing at a film college, making several documentary films, and serving as Abbas Kiarostami’s assistant director in Under the Olive Trees (Zire Dara khatan Zeyton, 1994), Jafar Panahi made his directorial debut in 1995 with The White Balloon (Badkonake Sefid). 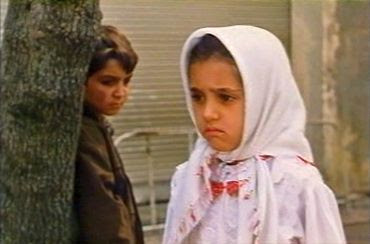 The film was co-scripted by Kiarostami, who would later also write the screenplay for Panahi’s Crimson Gold (Talaye Sorkh, 2003), and the film followed the customary pattern of Kiarostami’s productions by employing almost exclusively nonprofessional actors essentially playing themselves. But even in this first production, Panahi displayed a mastery for visual narrative and humanistic portrayal that distinguished him from Kiarostami. This distinction is also manifested in their two contrasting camera styles. Kiarostami’s cinematography has often employed static, long-take close-up shots depicting lengthy statements by individual characters, which were frequently intercut with very wide shots depicting the environmental landscape. From the outset, however, Panahi displayed a more fluid and dynamic visual style. He uses moving camera tracking shots so skilfully that they compare to studio shots undertaken on camera tracks, and his dynamic editing maintains an interactive narrative discourse without interrupting the “realist” setting. When you watch The White Balloon, you are seeing the camera work of someone who has already mastered the craft. Filmmaking in Iran is undoubtedly fraught with extra difficulties, and Iranian filmmakers have always wrestled with the severe restrictions imposed on them by government censors, particularly during the years outside the relatively tolerant and humane period corresponding to Mohammed Khatami’s presidency (1997-2005). In many cases the safest option was to tell stories about children, which led to some creative productions along these lines, such as Kiarostami’s Khane-ye Doust Kodjast? (Where Is My Friend’s Home?, 1987) and Majidi’s Children of Heaven (Bacheha-ye-Aseman, 1997). 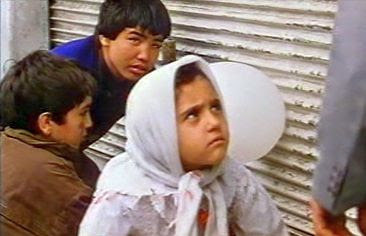 Panahi’s The White Balloon and his subsequent The Mirror (Ayneh, 1997) were additional entries in this Iranian film genre. In the case of The White Balloon, we have almost a textbook case of how one can make a film of interest out of everyday, mundane events. The key to The White Balloon and what makes it charming, though, is that while the events are mundane from an adult’s perspective, they are highly dramatic, with huge ups and downs, from the perspective of the child protagonists. The story is set on the day before the Iranian New Year (“Nowruz”) and concerns a seven-year-old girl, Razieh, who wants her mother to purchase a colorful goldfish for the festivities. The Iranian Nowruz takes place on the first day of spring and is the principal holiday period in Iran, with the Nowruz holiday season lasting two weeks. It can be compared with Christmas in Western countries, since it is the major gift-giving holiday. This ancient holiday tradition is pres-Islamic and celebrates the annual rebirth of nature. The mythical figure of Nowruz is “Haji Firuz”, who is usually colorfully dressed and in blackface. During this period one often sees figures dressed as Haji Firuz on the street, dancing gaily and making raucous music with tambourines. Iranians traditionally decorate their home with a “haft sin” table that features seven food items that begin with the letter ‘s’ (in Farsi, ‘sin’) which have the symbolic meaning of renewal and good fortune for the coming year. The table also traditionally includes a goldfish in a bowl, symbolic of life. Thus in the spirit of the traditional holiday festivities, Razieh wanted the family haft sin table to display a truly grand goldfish for the occasion. Note that the Iranian calendar is slightly more accurate than the traditional Western Gregorian calendar, and the moment of New Year takes place precisely at the moment of the vernal equinox. This means that it can happen at any time of the day on the eve of Nowruz. In The White Balloon the viewer is informed that the New Year will begin in less than two hours on that afternoon. The film then proceeds in real time, in the sense that the film duration parallels diegetic time. Thus in the first shot of the film, Haji Firuz clowns are seen on the street while the viewer is informed by an offscreen radio voice that the new year will begin in seventy-eight minutes, and at the very end of the film the same radio voice announces the beginning of the new year..
Introduction – Wanting a Goldfish (18 minutes). Razieh is seen tagging along after her mother on the street and nagging her about getting a nice, “chubby” goldfish for Nowruz. This scene provides the background for the family home, which is in a compound close to a local bazaar. 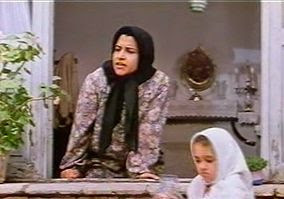 Razieh’s mother is played by newcomer Fereshteh Sadre Orafaiy, a superb, natural actress who would later star in The Circle (Dayereh, 2000) and Café Transit (2005). Razieh has an older brother, Ali, who is about ten or eleven, and has a rather demanding father, who is heard but never seen onscreen in the film. Razieh’s mother is busy with holiday preparations and sees no point in purchasing a new goldfish from the market when the family already has a goldfish pond full of fish. But Razieh whines that she is not satisfied with their own ponds’ population of “skinny” goldfish, she wants to buy a chubby one that she saw in the market. Finally after strenuous remonstrations, Razieh gets her way and is given a 500-toman note and told to buy the desired goldfish for 100 tomans. (The “purchasing value” of 500 tomans at that time might have amounted to a couple of dollars.) The task goal for this episode was to get permission to buy the goldfish, which was accomplished The goal is now to go out and purchase the goldfish. The Snake Charmers (7 minutes). Razieh, now wandering towards the bazaar on her own, succumbs to the forbidden temptation of watching two scruffy snake charmers performing in front of a crowd of idlers on the street. 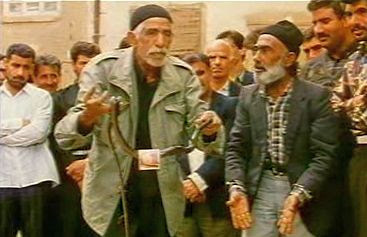 The snake charmers immediately incorporate the frightened Razieh into their act and snatc h her 500-toman banknote as part of their show. This is a charming scene, and it shows the strange and threatening world outside home, as seen by a young child. After more tears and protests from Razieh, she gets her banknote back and moves on. The goal of this episode was merely to survive the events in tact, and that at least was accomplished. The goal remains to go out and buy the fish. Losing the Money (16 minutes). Razieh makes her way to the fish shop and identifies her “chubby” goldfish, but now another disaster strikes: she has lost her banknote somewhere on the way. A kindly matron offers to help the again-tearful girl, and they retrace Razieh’s steps from the time when she last remembered having the money. They do manage to find it on the street, but it has fallen through a drain grating in front of a closed-up shop. The lady talks to the shopkeeper next door, a busy tailor named “Bachtiari”, who agrees to assist Razieh. But after the lady leaves, Mr. Bachtiari is too preoccupied with arguments in his shop to attend to Razieh, and she doesn’t know what to do. The goal of this episode had been to find the lost money, which was accomplished, but now the remaining task is to retrieve it somehow from the drain. Ali Comes to Help (13 minutes). At this point Razieh’s brother Ali, who has been looking for her, finds her on the street. The older and more assertive Ali tries his hand with Mr. Bachtiari, but he doesn’t make much headway. 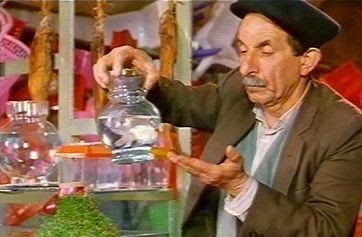 After a failed attempt to fish out the money from the drain, Ali is merely instructed by Mr. Bachtiari to wait until after the Nowruz season is over when the neighbour shopkeeper is likely to return. This might make sense to an adult, but to the two children it would spell absolute disaster if they were to return home to their demanding parents without the money. Ali then goes off to see if he can find the address of the owner of the closed shop that has their money under its drain grate. So the goal is now to find the missing shop owner. The Soldier (13 minutes). Razieh is now approached by a drafted army soldier from the provinces, who wants to chat with her. This is another scary episode for Razieh, who, like most well-bred young children, has been instructed never to talk to strangers. Indeed the soldier’s motivations are unclear: he might simply be bored and lonel y; he may be after the banknote; or perhaps there is something worse on his mind. Gradually he wins Razieh’s confidence against her will, but Ali returns to the scene to terminate their colloquy, and the soldier moves on. Again an uncertain distraction has been dispatched, and the goal remains to recover the money from the drain. The Afghani Boy (11 minutes). Now they spy an Afghani boy selling balloons on the street, and after a scuffle over the boy’s balloon pole, they begin working together to use the pole to retrieve the money from the grating. It is agreed that chewing gum stuck on the end of the pole should do the trick, and Ali is momentarily tempted to steal some gum from a blind street seller. But he changes his mind, and in the meantime the Afghani boy has bought some gum. Quickly the money is then retrieved, and the problem has finally been solved. Their goal achieved, Ali and Razieh joyfully run off to get their goldfish. The final shot shows the abandoned Afghani boy standing there with his one, unsold balloon, a white one. The charm of The White Balloon is that the “small” world of children is presented precisely in the dramatic way that it is perceived by them. The camera framing and perspectives are entirely from the level of the children and what they see. The narrative mood is sustained by Aida Mohammadkhani’s determined performance as Razieh, which presumably was carefully managed by Panahi. Her tears in the snake-charmer’s scene appear quite genuine, just as do her sudden flashes of joy when she sees her fish or when her lost money is discovered. All the other performances by the nonprofessional cast also have the look and sound of authent icity. Panahi’s well-crafted mise-en-scene and cinematography make this small story come alive. Although his techniques are different from those of the Italian neorealists, the comparison of this first work of Panahi’s to theirs is apt: they both sought to uncover the humanity of the everyday. But upon reflection, this small world of children is not really so small, after all. It includes all the fears of the bizarre and the threatening, as well as the anxieties concerning financial ruin and punishment. It also includes the joys of opportunistic encounters and fleeting friendships that all-to-quickly pass away before we know it. It is the same world of human values and experiences that we all live in, whether on the city streets in a country far away or in your own local neighbourhood. This is one of the best analysis of Panahi's film I have come across... But in my opinion the subtle pretexts and philosophies didn't come out well in the article.. but from technical point o view... it's nice and erudite..